At Sands Anderson, engaging with and helping to lift up the communities we work in is essential to our firm’s focus on supporting your success from day one. From our perspective, complete legal guidance is just one of the many ways to support our community members. In order to do our best work, we believe in giving back to the communities that also support our success. Over our 175-year legacy, we’ve maintained a strong history of engaging with a variety of civic, charitable, and professional organizations. We do so through contributions and active involvement as members, volunteers, and leaders. Whether that means volunteering at a local nonprofit, sponsoring fundraising events, or more, we genuinely enjoy giving back — and encourage all employees to do the same. Across our firm, we have committed our community efforts to focus on a topic near to our hearts: literacy. We understand that we work within a highly educated industry, and literacy is a fundamental to our daily lives. As such, we recognize that not every person in our communities has equal opportunity to foster their literacy skills. We want to do our part to help lift up and support community members lacking literacy opportunities, abilities, or access. Reading is about more than texting a friend or enjoying a novel — literacy levels are critical to the fundamental health of our communities. When people are illiterate, they’re unable to equip themselves with essential information that can enrich and improve their own lives. Focusing on literacy enables us to apply our skills and passion to help those who are underserved. 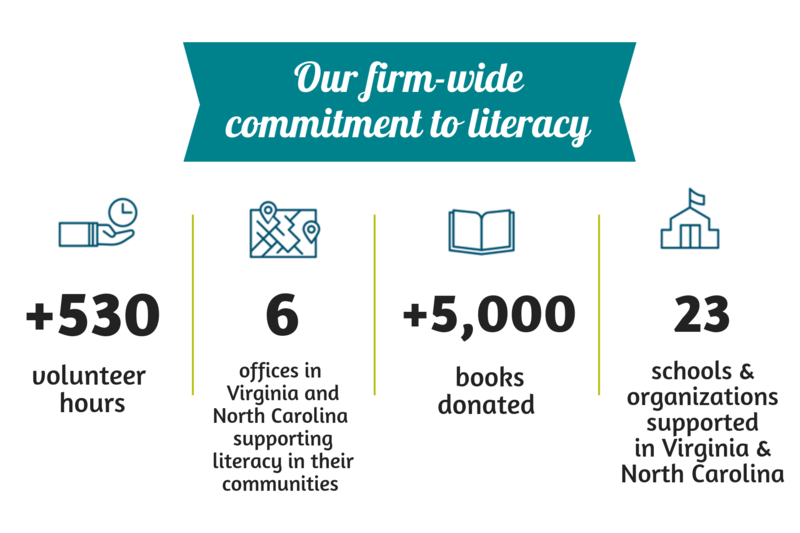 Whether organizing book drives for schoolrooms, donating literacy materials to nonprofits, or other outreach, we’re committed to helping our communities thrive through the power of literacy. We formed our literacy committee in 2017 to strategically guide our firm’s community efforts. Our committee comprises 14 individuals with representatives from each of our offices, including attorneys, professional assistants, paralegals, and administrative staff. These committee members come from across the firm to dedicate their time and passion to foster our community outreach. Together, we identify and guide the outreach that aligns with our firm’s giving mission and best supports our communities. To celebrate National Book Lover’s Day we asked staff and attorneys at Sands Anderson to share their favorite books and why. Click here to read their recommendations! This Richmond-region unofficial association brings together 13 law firms (including 2 corporate legal departments). The goal is to provide legal support to people who need lawyers but can’t afford them. We’re proud to be a founding member. In conjunction with The Virginia Bar Association & Greater Richmond Bar Foundation, this initiative’s goal is to help bridge “the literacy gap.” We provide law firms and attorneys with resources that make it easier to engage with those who need legal aid. By doing so, we help them meet the Virginia Supreme Court Rule of giving 2% of legal services to underserved communities. We’re proud to serve as founding members of this initiative. The goal of The Captains’ Table is to provide local nonprofit CEOs and executive directors in the Richmond region with monthly networking and educational opportunities. They learn essential nonprofit management details such as fundraising best practices and selecting quality board members, among other topics. They also have an outlet for connecting with fellow community members and fostering deeper collaborative efforts across all community efforts. As co-organizers of this community program with Union Bank, we’re proud to support local non-profits.